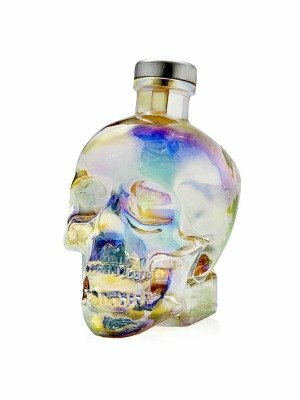 Crystal Head Aurora Vodka is a popular Vodka available from DrinkSupermarket.com in 70cl to buy online. Visit DrinkSupermarket.com for the best price for 70cl of Crystal Head Aurora Vodka or compare prices on our other Vodka products. Our Crystal Head Aurora bottle was created in celebration of this natural light display, with its beauty and mysterious visual properties. Aurora uses high quality English wheat and pristine water from Newfoundland, Canada to craft an additive-free vodka. The vodka is five times distilled and filtered seven times. Three of the filtrations pass through layers of Herkimer diamonds as our final distinctive touch. Instead of exploring different flavours, Aurora was crafted using a different grain. It offers a drier, bolder, and spicier vodka while staying true to the Crystal Head house-style. The bottle, with its delicate and iridescent metallized finish, is our tribute to this natural wonder of the world. Where to buy Crystal Head Aurora Vodka ? Crystal Head Aurora Vodka Supermarkets & Stockists. You can buy Crystal Head Aurora Vodka online in most retailers and find it in the Vodka aisle in supermarkets but we found the best deals online for Crystal Head Aurora Vodka in DrinkSupermarket.com, Amazon.co.uk, and others. Compare the current price of Crystal Head Aurora Vodka in 70cl size in the table of offers below. Simply click on the button to order Crystal Head Aurora Vodka online now.